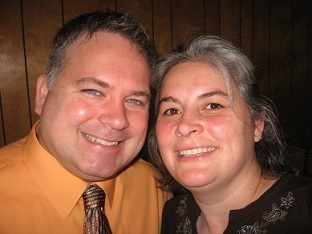 I'm Pastor Craig Thompson and I'm excited about serving here at East Side Church. Rikki and I grew up near Lancaster, Ohio. We graduated from high school together, and were married in 1996. I had every intention of becoming a history professor when I entered Malone University, but during my sophomore year, I felt the definite call of God to pastoral ministry. I have had the pleasure of serving as a youth pastor at Sixteen St. John's Church in Massillon, Ohio, and Tyler Memorial United Methodist Church in Chillicothe, Ohio. I left Tyler UMC to attend Gordon-Conwell Theological Seminary in Massachusetts, where I obtained my Master of Divinity Degree and Rikki received her Master of Arts in Church History. After seminary, I had the pleasure of serving as the pastor of the First Baptist Church of Barre, Vermont for over nine years. I enjoy preaching, teaching, reading church history, eating pizza, and listening to music. I also enjoy racquetball, taking walks in cemeteries with Rikki, and playing board games.